Though far from mainstream, freak-bike gangs have become a fairly ubiquitous part of American bike culture. Black Label Bike Club, C.H.U.N.K. 666, Dead Baby, most major cities seem to have their own version of tall-bike riding, vest wearing, bike clubs. But long before crusty punks were bike jousting under bridges, the clean-cut Chicago chapter of the National Bicycle Dealer’s Association was building amazing freak bikes in their bike repair shop. To Webster a bicycle is ‘a light vehicle having two wheels, one behind the other.’ Such a definition theoretically describes the contraptions [seen in the article], but fails to do justice to the imagination of the Chicago chapter of the National Bicycle Dealers’ Association. By artfully applying welders’ torches to metal tubing, the chapter’s members transform ordinary, utilitarian bicycles into traveling monstrosities. 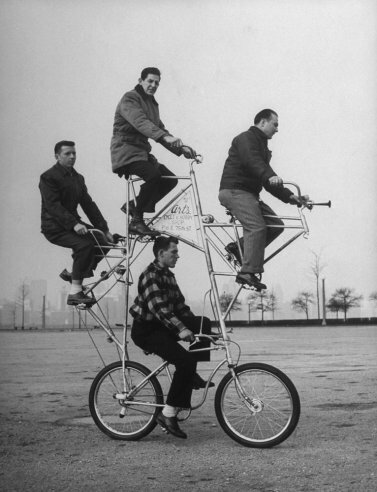 By far the most outlandish ideas have come from the Steinlauf family, who produced from their bicycle repair shop most of the oddities [shown in the article]. They are hazardous; generally at least one member of the clan is to be found in the hospital. Here are a few more of the photos from Life. Click to see the full gallery on Time Magazine’s Life archive.